The Woods Theatre was listed as the only operating movie theatre in Chino in 1941 with a seating capacity given as 268. In 1947 the town of Chino gained a second movie theatre when the Chino Theatre opened (designed by noted theatre architect S. Charles Lee). Whether this rivalry spurred on the owners of Woods Theatre to increase its capacity is unclear, but in the 1950 and 1952 editions of Film Daily Yearbook the seating capacity of Woods Theatre was given as 460. The correct name is Woods Theatre, without an apostrophe. The owner was an A.L. Woods. FDY may have been a bit late in upping the reported number of seats in this house, unless the theatre was expanded twice, or its original expansion plans had to be put off. The August 27, 1937 issue of Southwest Builder and Contractor announced an impending remodeling and expansion of the Woods which would double the theatre’s capacity. One of the posters on the Chino Theater page stated that the Woods was used as an army surplus store in the seventies and was razed in the 1990s. I’ve come across a couple of references that must be to this theater, in issues of Boxoffice Magazine dating from 1937. 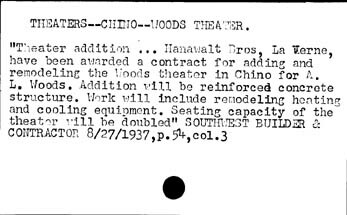 They mention the operator as A.L Woods or Ashley Woods, but cite him as the operator of the “Chino Theatre, Chino.” I wonder if Chino Theatre was an actual aka for the house before it became the Woods, or if Boxoffice was just careless about the name? In the 1912/13 city directory there’s a listing for The Vaudette, 6th (east side), corner of C.
In 1914 it’s still The Vaudette, “E.S. 6th bet C & D.” In 1919/20 it’s now the Chino Theatre, with the same address. In the 23/24 book it’s the Chino at 328 6th. From 1926 through the 1951 directories it’s the Woods Theatre. In the 1951 directory we get the “S.” added to 6th St.
It’s in the 1928 and 1931 city directories. The address currently listed is obsolete. At some point, Chino has adopted the county-wide numbering system, and the theater’s former site is in what is now the 13100 block. If 328 6th was on the east side of the street, it even looks like odd and even numbers have switched sides, with even numbers now being on the west side of the street. It also looks like almost the entire neighborhood has been redeveloped for residential use within the last couple of decades. The whole east side of the block between C and D Streets is lined with small apartment buildings. The Woods Theatre must have been demolished.